We’d love your help. Let us know what’s wrong with this preview of Alienne Mine by Deborah O'Neill Cordes. To ask other readers questions about Alienne Mine, please sign up. 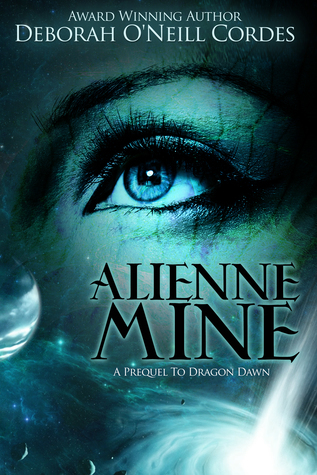 Alienne Mine, a stand-alone prequel to Dragon Dawn, teleports readers to that realm between reality and imagination, where space travelers connect through thought and technology, but most of all in that purest of ways, through love. Ed McAdams left Earth to explore and exploit space as a member of an asteroid mining team, but realizes he knows nothing when he meets Drajulal-kishah, or Alienne, a sentient, and spectacularly beautiful reptilian alien, who considers him her Chosen. Only an author as Alienne Mine, a stand-alone prequel to Dragon Dawn, teleports readers to that realm between reality and imagination, where space travelers connect through thought and technology, but most of all in that purest of ways, through love. Only an author as talented as Deborah O’Neill Cordes can spin a story with the scientific precision, understated, captivating passion, and intriguing possibilities that readers will find in Alienne Mine. Intricate alternate galaxies, very real human foibles, hints of the dark tendencies of our own worlds and others, come together in a short, enormously satisfying read that ignites a thirst for more of the Dawn of Time characters and stories. Alienne Mine is available for pre-order on Amazon.com now, and highly recommend it. I received an ARC in exchange for my honest opinion . Can he leave everything he knows Alienne has been watching Earth in exile from her home planet. As humans approach Mars, she becomes even further intrigued. One is different from the others. Ed McAdams calls as only a chosen one can. Though different species, the draw is strong. Review to come. When I get my thoughts in order. Alienne, a clandestine being far from her home planet traveling the solar system and watching Earth, one of her favorite places, stumbles upon a human astronaut. Her ability to read auras allows her the knowledge that this human ... Edward McAdams ... is not just any regular human to her. While she finds herself often fascinated with the humans on earth, she is even more drawn to Edward than any. because he is her Chosen -- the one being Review to come. When I get my thoughts in order. Alienne, a clandestine being far from her home planet traveling the solar system and watching Earth, one of her favorite places, stumbles upon a human astronaut. Her ability to read auras allows her the knowledge that this human ... Edward McAdams ... is not just any regular human to her. While she finds herself often fascinated with the humans on earth, she is even more drawn to Edward than any. because he is her Chosen -- the one being in the entire creation that she is meant to love, protect, and hold close for the remainder of her long life. But is it the differences between Alienne and Edward, or the dangers hiding in the surrounding planets that may keep her from her Chosen? I adored Dragon Dawn by Ms. Cordes. It was a fascinating tale that weaved romance with time travel and dinosaurian aliens. READ THAT NOW. Alienne Mine is a prequel of sorts to Dragon Dawn, and a very short novella that essentially, gives readers a chance to see there are far more beings in the Dragon Dawn 'world', so to speak, that are there and watching. Alienne Mine was lovely, it truly was. I am good with Sci-Fi and aliens (I used to say as long as there were no scales or tails, I could handle it) but I was even good with that in Dragon Dawn. These differences in the beings make them special and unique. They're not human, but they're so similar in ways that you often don't notice the mentions of square pupils or bluish tinged skin. Never mind the differences in the aliens of Dragon Dawn. I was rooting for a sweet moment, for Alienne to get her Chosen by the end of Alienne Mine. And we also got to see what happened to the Edward we see mentioned in Dragon Dawn. GIVE ME ONE OF THOSE OKAY. Alienne Mine is the stand alone prequel to the exceptional book, Dragon Dawn, Book One of the Dinosaurian Time Travel Series. An exotic alien being watches Ed McAdams, an astronaut minng an asteroid in 2022, and decides he is her Chosen. It is time to show herself to him. Edward’s First Contact defies everything his government has led him to believe about extra-terrestrials and he is captivated by Alienne and the life she offers him. Now he is faced with a decision: to leave his home, his career Alienne Mine is the stand alone prequel to the exceptional book, Dragon Dawn, Book One of the Dinosaurian Time Travel Series. An exotic alien being watches Ed McAdams, an astronaut minng an asteroid in 2022, and decides he is her Chosen. It is time to show herself to him. The author’s love and intricate knowledge of all things astronomical is evident in her visually realistic descriptions of the vast universe. We are taken on a journey through space experiencing colours, sounds, technology and previously unknown (to me) planets, moons and even galaxies. And the vivid descriptions of the enthralling Alienne allowed me to picture shimmering hues of blue-green, rippling silky scales and emerald eyes. Top this off with an HEA and any reader of romance will be more than satisfied. I'm admittedly a little behind, having started Dragon Dawn but haven't finished it thanks to life just being bonkers. When I heard that this was a prequel, I decided to read it first. I was not disappointed, and I think I'm going to use Super Bowl weekend (and my boyfriend's general disinterest in life during said weekend) to get directly on top of restarting (and finally finishing) Dragon Dawn. Deborah O'Neill Cordes is a pro when it comes to descriptive writing; all that she wrote where the exp I'm admittedly a little behind, having started Dragon Dawn but haven't finished it thanks to life just being bonkers. When I heard that this was a prequel, I decided to read it first. I was not disappointed, and I think I'm going to use Super Bowl weekend (and my boyfriend's general disinterest in life during said weekend) to get directly on top of restarting (and finally finishing) Dragon Dawn. Deb O’Neill Cordes is fast becoming one of my favourite authors. I think her success is because she writes about what she knows and loves. Either that, or she does bloody good research! Probably both. Now I’m not a big fan of romance stories, but Deb has managed to make this eminently readable with her classy writing style, attention to detail and believable science. The characters are an interesting mix and add a bit of spice to this dish, and there are hints of what is to follow in “Dragon Dawn Deb O’Neill Cordes is fast becoming one of my favourite authors. I think her success is because she writes about what she knows and loves. Either that, or she does bloody good research! Probably both. Now I’m not a big fan of romance stories, but Deb has managed to make this eminently readable with her classy writing style, attention to detail and believable science. The characters are an interesting mix and add a bit of spice to this dish, and there are hints of what is to follow in “Dragon Dawn”, another great book. If you’re looking for a short story you can knock over in a few hours, and like a bit of romantic sci-fi, this is definitely for you. An interesting adventure through time and space with a unique blend of science, time travel, and romance. I enjoyed the colorful descriptions of this prequel. Even though Alienne Mine is a novella nothing is sacrificed. The story pacing is quick and makes you want to keep turning the pages to see what happens next. The world building is multi-dimensional as is the character creation. It had the feel of a book three times it's length as far as the complexity of the storytelling. When I finished I wanted to know more. It works as a stand-alone read or as a lead in to Dragon Dawn which I also loved! A sweet romance about an Earthly man and an alien female. They are both lonely and losing faith in their own species. Aliene has some evidence that earth and all of the humanity could be in danger. But should she try to help out or be mere observer. I particularly liked the scenes describing other worlds and planets. Their descriptions make you feel like you are there along with Edwards and Aliene. Deborah O'Neill Cordes is a screenwriter and novelist of historical and speculative fiction. Her fiction blends fields of study she loves in equal measure; she holds a bachelor’s degree in zoology and a master’s degree in history. Deborah is the author of the sci-fi time travel novel, Dragon Dawn, Book One of the Dinosaurian Time Travel Series, and Alienne Mine, A Prequel to Dragon Dawn. She is al Deborah O'Neill Cordes is a screenwriter and novelist of historical and speculative fiction. Her fiction blends fields of study she loves in equal measure; she holds a bachelor’s degree in zoology and a master’s degree in history. Deborah is the author of the sci-fi time travel novel, Dragon Dawn, Book One of the Dinosaurian Time Travel Series, and Alienne Mine, A Prequel to Dragon Dawn. She is also the co-author of the Morgan O’Neill time travel novels, which she writes with Cary Morgan. Three of Deborah’s works have been optioned by Hollywood, while many others are award winners, garnering finalist placements in the Pacific Northwest Writers’ Conference Literary Contest, semi-finalist wins in the William Faulkner – William Wisdom Creative Writing Competition, and the Metro Goldwyn Mayer Finalist award in the Seattle International Film Festival’s Perfect Pitch Forum. She resides in the Pacific Northwest with her husband and two West Highland White Terriers, who, alas, are precocious terriers and therefore never white.